Luxury nightclub experience in the heart of the North East. True to its name Vanity really is a touch of Class in the heart of the North East, glittering with glamour from wall to wall. Designed to impress with its sophisticated décor, original style, enticing lights and cutting edge music Vanity is the only place to be at the weekend or for yor Debs Venue , Hen party or Stag parties..
Vanity Nightclub provides a new kind of entertainment and choice for over 18’s. “Loose Fridays” over 18’s. 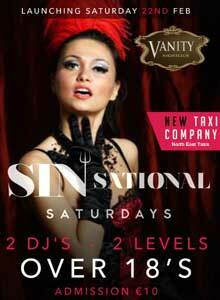 Saturday nights over 18’s; 1/2 price Adm from Jayz Bar and Dustys Bar to Vanity! Do you want a Debs Venue with a Difference? Check out this new “State-of-the-Art” Dream Debs Venue, the best in Ireland. Enjoy a night to remember with our exclusive Hen and Stag Party packages for a Luxurious Nightclub Experience.